Brief Description of Subject: This window entitled Salvator Mundi (Savior of the World) represents the coming of the Holy Spirit at Pentecost as described in the Book of Acts, as well as imagery from the Book of Revelation. 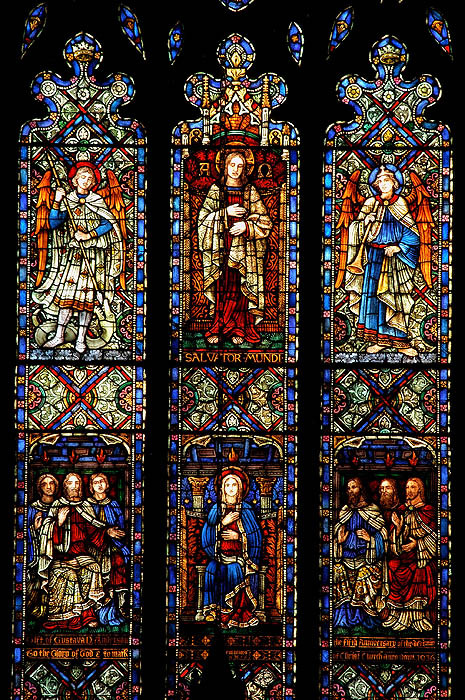 In the window's central panel we see a resurrected Christ (top center), holding his side—"shielding the wound in His side, the significance of this being that as saviour of the world, though He be in glory with His Father everlastingly, He is still the Lord who gives His life." The symbols of Alpha and Omega are on either side of Christ's head, from the text of Revelation: "I am Alpha and Ome'ga, the beginning and the end." To the left of Christ is St. Michael slaying the devil in the form of a dragon and to his right is St. Gabriel with a horn at the gate of heaven. In Revelation the archangel Gabriel (although unnamed) is among the seven angels who blow the horns bringing forth the apocalypse. Beneath them is a seated Virgin Mary, flanked by six unidentified apostles. Above their heads are seven small flames, a reference to the cloven flame of the Day of Pentecost, as described in Acts II. In the scripture, after the ascending Christ had directed the apostles through the Holy Ghost and they returned to Jerusalem (Acts 1: 1-12), on the Day of Pentecost the apostles were filled with the power of the Holy Ghost: "And there appeared unto them cloven tongues like as of fire," enabling them to speak in many languages and spread the word of God to thousands of people. The seven flames refer to the Seven Gifts of the Holy Spirit, the more commonly used reference to the Seven Gifts in scripture coming from Book of Revelation (5:12) (Blessing, Glory, Wisdom, Thanksgiving, Honor, Power and Might).5 A traditional variation of the Seven Gifts may also be found in Isaiah 11:2.